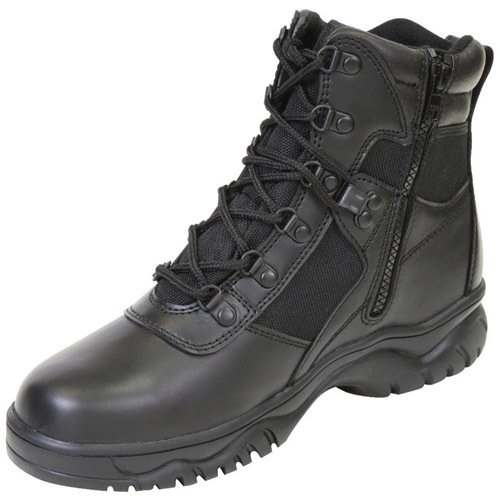 This tactical boot comes in black color with 6 inches of height. It is waterproof and blood- born pathogen membrane mixture. The boot is constructed from leather and the top portion is made from nylon. The shoe collar is also made from leather material. It comes with D-Ring type of holes. It has a YKK side zipper as well as hook & loop closure tab. It also has a steel shank as well as gusseted tongue. This high quality boot has removable insole with moisture wick lining. It comes with rust proof stuff and slip resistant bottom part. This is a great choice to use during the rainy and icy weather conditions.